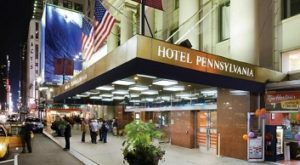 Hotel Pennsylvania (2 stars, 20.621 reviews, 6.0) is one of the most popular hotels in New York City. The hotel has a very central location across Penn Station. To Times Square is a 15-minute walk. 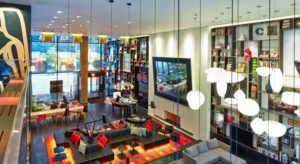 citizenM New York Times Square (4 stars, 6261 reviews, 9.0) is located in the heart of Manhattan. It is a 5-minute walk to Times Square. 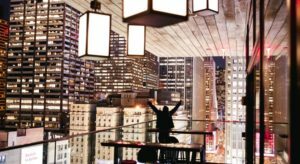 Hotel facilities include 3 outdoor terraces with rooftop bar. 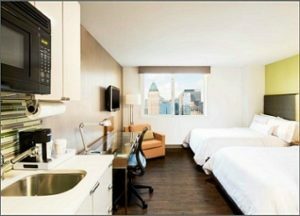 Element Times Square West (3 stars, 7016 reviews, 8.4) is a 3-star property in the Theater District. Nearby are Times Square, Penn Station and the subway. New York is the largest city in the USA with 8.5 million people. It’s located in on the Atlantic coast in the North East. New York City consists of five boroughs: The Bronx, Brooklyn, Manhattan, Queens and Staten Island. The city is often called “New York City” (NYC) to distinguish it from the state of New York. 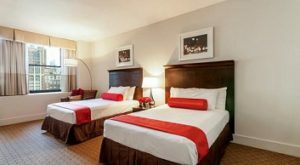 One of the most popular discount accommodations in NYC is two star Hotel Pennsylvania. The hotel is closeby Madison Square Garden and Penn Station. 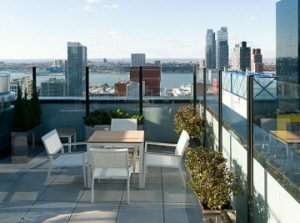 Other favourite hotels in NYC are the four star Hudson Hotel near Central Park and Park Lane Hotel near 5th Avenue. Most international visitors will arrive at JFK International Airport. The AirTrain JFK is the cheapest transportation but doesn’t travel directly to Manhattan. Passengers have to transfer to either a subway or other train. The Airport Express Bus cost $15 ($22 return) and provides transportation service to and from Manhattan between 6.00 and 23.00. A taxi to Manhattan is $45 flat fee excluding toll and tip.